We’ve enjoyed sharing this Christmas season with you. from my colleagues at Guideposts and me. cozy, and filled with joy and wonder. and joy throughout the New Year! full of dear memories old and new! of stories and our blog with your support! and New Year filled with God’s bounty and His love. Thank you for supporting us as authors! who have supported us on this journey. the birth of our Lord and Savior. Thank you, sweet reader, for making my holidays so special. your home this Christmas season. Wishing you a joyful celebration of Christmas. and may you have time to savor some good stories. celebrate God’s greatest gift to us–Jesus. added blessings and captivating books to read. of the greatest gift of all—Jesus. Merry Christmas from the Walker home to yours! This will be our final post for 2014. We hope to see you back here in the fall of 2015. Thank you to each one who visited our blog and entered the drawing. She’s won the following prize package valued at $110. A $70 Amazon gift card, offered by A Cup of Christmas Cheer authors. Be sure to visit the blog on Friday, December 19 for our final post of this year. 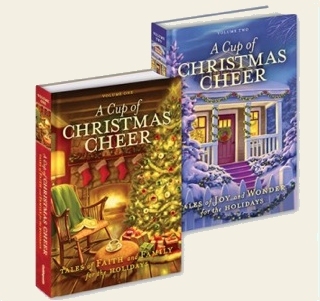 Our editors and several A Cup of Christmas Cheer authors have special greetings for you. Our winner will receive a prize package valued at $110. Enter to win the drawing on Rafflecopter’s site by clicking this link. The giveaway has ended. The winner is announced in our Dec. 17 post.